South Lake Tahoe is the largest city on Lake Tahoe, and as the name suggests, is located on the southern end of Lake Tahoe. South Lake Tahoe is also right across the border from Nevada, where Stateline is located. The transition between Stateline and South Lake Tahoe is almost unnoticeable to most people, with only the casino's really marking the line between California and Nevada. 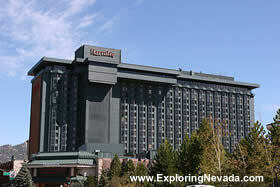 On this page are listings of all hotels and casino's in South Lake Tahoe, California and Stateline, Nevada.